A piece of ice that can't be bypassed? Looks great on paper right? The problem with Guard is that the most common source of bypassing ice (Femme Fatale) can just break this anyway. If it had been strength 4 or a barrier, for example, then I think it would justify it's 4c rez cost. As it is, there are too many other good options to justify a card whose only purpose is to block an Inside Job. Guard basically has all the problems of Rototurret being a low strength sentry without the very useful Trash 1 Program subroutine. Although Guard will stop Inside Job you still can't reliably rush an early Agenda behind it because Self-modifying Code, any Killer or an AI breaker will eat it for breakfast. The worst part about Guard's 'anti-bypass' ability (which also 'stops' Femme Fatale, Feint or Security Nexus) is that it doesn't stop the most common type of runner bypass! I'm talking about Blackmail, DDoS and Leela Patel: Trained Pragmatist bounce. Guard is over-priced and under powered. Every faction except have better Sentry Ice that can End the run. 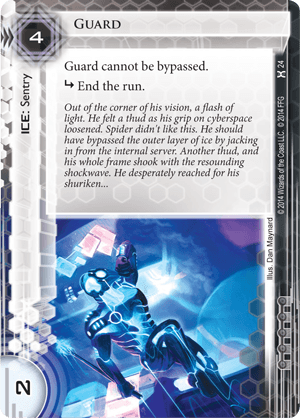 and Jinteki would rather use their sentry ice to end the runner.